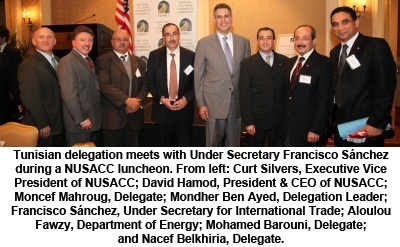 The National U.S.-Arab Chamber of Commerce has just wrapped up visits by the first two delegations to come to the United States from Tunisia since that nation’s revolution took place on January 14, 2011. The first delegation, composed of non-governmental organizations (NGOs), met with NGO leaders and U.S. Government officials interested in strengthening civil society in Tunisia. The second delegation, made up of business representatives affiliated with the Tunisian American Chamber of Commerce (TACC), met with private and public sector leaders focusing on the business environment and Tunisia’s rule of law. 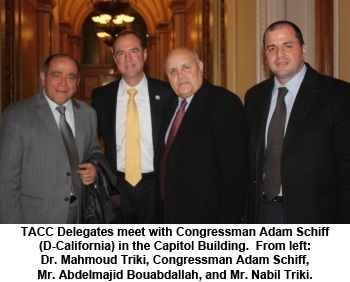 ​The TACC delegation met with Members of Congress who expressed strong support for Tunisia’s democracy movement, including Senator Joseph Lieberman (I-Connecticut), Rep. John Dingell (D-Michigan), Rep. Betty McCollum (D-Minnesota), Rep. Charles Boustany (R-Louisiana), and Rep. Adam Schiff (D-California). Congressman Schiff who was deeply inspired by the delegates story of Tunisia’s revolution said, “I am committed to ensuring that we vigorously support Tunisia's people-powered revolution, and help that nation in its moment of transition to democracy." In part in response to visits by these delegations, members of the U.S. Senate have introduced S.618, a bipartisan bill designed to support entrepreneurs and job creation in Tunisia. 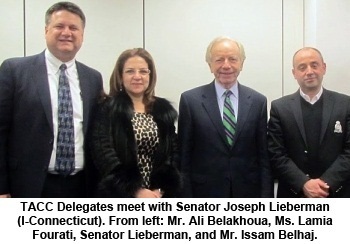 The bill, co-sponsored by Senators John Kerry (D-Massachusetts), Joe Lieberman, and John McCain (R-Arizona), would create a Tunisian-American Enterprise Fund to provide between $10 to $20 million of capital to new businesses in Tunisia. The visits come at a critical time for Tunisia in its quest for democratic reform. As a result of that North African nation’s political instability – from within its own borders and from its neighbor, Libya – Tunisia will for the near term be fighting a “triple whammy” of falling investment, plummeting tourism revenues, and surging numbers of refugees. * Provide incentives for U.S. companies to do business with and invest in Tunisia. * Reduce tariffs on select Tunisian exports that are competitive and will help to generate good jobs in Tunisia. These include information and communications technologies (ICT), textiles, foodstuffs, and light industries like automotive parts. According to a new study published by the National U.S.-Arab Chamber of Commerce, sales of U.S. goods and services to Tunisia are on track to grow to $970 million by the year 2013. The Tunisian American Chamber of Commerce delegation was comprised of 16 business delegates from such sectors as ICT, textiles, manufacturing, education, banking & finance, accounting, and law. Three of the delegates represent U.S. companies in Tunisia: Ernst & Young, Cisco Systems, and Microsoft. ​At an event co-hosted by NUSACC and the Woodrow Wilson Center for International Scholars, TACC delegates discussed the democratic developments and challenges after the Jasmine Revolution. Moderator Haleh Esfandiari, Director of the Middle East Program, said, “Tunisia and Morocco are among the most progressive countries in the region when it comes to women’s rights.” Delegates agreed this is one of the many strengths Tunisia has in place to move the country forward.